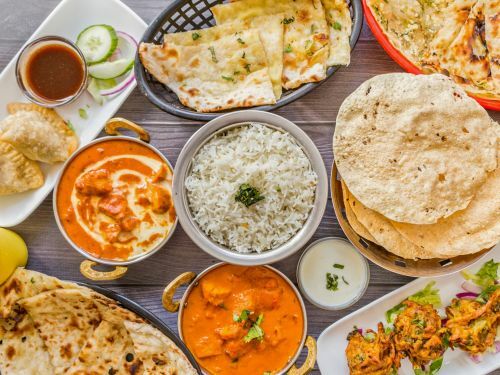 Menulog delivers for Masala Art - Petrie Terrace so you'll be able to track your courier on a map. Serves two adults and two children. 2 x Curries, 2 x Naan and 1 x Large Serve of Steamed Rice. 4 x Papadums, 4 x Onion and Spinach Pakora, 2 x Regular Curries, 2 x Rice, 2 x Plain or Garlic Naan and 1 x Raita (Cucumber and yoghurt). 6 x Papadums, 6 x Onion and Spinach Pakora, 3 x Regular Curries, 3 x Rice, 3 x Plain or Garlic Naan and 1 x Raita (Cucumber and Yoghurt). Four pieces. Onion and spinach dipped in split pea batter and gently fried until golden fried. Four pieces. Freshly blend spinach and mashed potatoes cutlet dipped in batter, spiced and then deep fried. Four pieces. Marinated minced lamb flavoured with onions, garlic, ginger and fresh coriander cooked in tandoor. Salt and pepper squid dusted with spiced rice flour and deep fried. Prawns marinated in aromatic spices and baked in tandoor. Four pieces. Boneless tender chicken pieces marinated overnight and cooked in tandoor. Fresh spring chicken seasoned and marinated in yoghurt herbs and spices overnight then cooked in tandoor. With onions capsicum and tomato marinated in yoghurt and cooked in tandoori oven. Chicken pieces cooked in tandoor then spiced in tomato, cashew nut and tomato sauce. Comes with free large rice. Chicken tender pieces cooked with spinach puree, cream and fenugreek. Comes with free large rice. Pieces of chicken cooked with capsicum, onion, tomatoes and finished with fresh coriander. Comes with free large rice. Chicken pieces cooked in mild creamy cashew nuts sauce. Comes with free large rice. Chicken tender pieces cooked in pineapple, capsicum and tomato. Comes with free large rice. Tandoori Chicken pieces cooked with capsicum, onion, tomatoes and finished with fresh coriander. Comes with free large rice. Chicken tender pieces cooked in spicy coconut sauce. Comes with free large rice. An authentic South Indian pepper hot chicken fillet tossed in gravy with fresh curry leaves and mustard. Comes with free large rice. Hot and tangy spice chicken tender pieces in a sauce. Comes with free large rice. Chicken tender pieces flavoured with garlic, soy and cooked with herbs, capsicum and spring onion in a hot chilli sauce. Comes with free large rice. Tender lamb moghul style dish cooked in cashew sauce, garnished with nuts. Comes with free large rice. Tender pieces of boneless lamb cooked in traditional Kashmiri spices, saffron and fresh coriander. Comes with free large rice. Lamb cubes cooked in potato curry and served with fresh coriander. Comes with free large rice. Lamb cooked in spinach, cream, fenugreek and spices. Comes with free large rice. Pieces of lamb cooked with capsicum, onions, tomatoes and finished with fresh coriander. Comes with free large rice. Lamb cooked in spicy coconut sauce. Comes with free large rice. Lamb cooked in hot and spicy sauce. Comes with free large rice. Cooked with lentil and spices. Comes with free large rice. Goat. Selected fine cuts of goat bone in cooked to perfection on slow fire with chef’s special ingredients and finished with fresh coriander. Comes with free large rice. Tender beef cubes cooked in a mild creamy cashew nut sauce. Comes with free large rice. Pieces of beef cooked with capsicum, onions, tomatoes & finished with fresh coriander. Comes with free large rice. Beef cooked muglai style with apricot and spices. Comes with free large rice. Cubes of tender beef cooked in cashew nut sauce and red wine. Comes with free large rice. Beef cooked in spicy coconut sauce. Comes with free large rice. Hot and spicy beef curry. Comes with free large rice. Tender fish cubes cooked in a mild creamy cashew nut sauce. Prawns cooked with green chillies, capsicum, onions and tomatoes. Prawns cooked in creamy cashew nuts, masala sauce and finished with Malibu. Split lentil cooked with spinach and spices. Whole black lentil and kidney beans cooked on slow fire overnight, finished with cream and spices. Simply fresh vegetable cooked with spices and sauce. Homemade paneer with mashed potato deep fried and cooked with our Chef’s special sauce. Eggplant tossed with onion masala sauce & tomatoes finished with a touch of cream and fresh coriander. Seasonal mixed vegetables in cashew nut creamy sauce. Special biryani rice cooked with spices, dry nuts and fresh coriander. Wholemeal bread from our clay oven. Plain flour bread topped with butter. Wholemeal flour with butter, baked in tandoor. Fresh garlic spread on naan bread. Plain flour bread filled with masala mash potatoes. Spinach stuffed with cheese naan. Onion stuffed with cheese naan. Hot Green Chilli Stuffed with cheese naan. Cheese naan stuffed with dry mixed herbs and finished with garlic butter. Naan bread stuffed with homemade cottage cheese. Naan bread stuffed with homemade cottage cheese and green chilli. Naan bread stuffed with minced meat. Naan stuffed with dates, coconut, cashew nuts & flavoured with aniseed powder. Two pieces milk balls in rose flavoured sugar syrup. Homemade Indian ice cream made with pistachio and vermicelli. Homemade Indian ice cream made with mango puree.